Description: Wildlife islands are an immediate way to provide waterbird nesting habitat and cover for trout in pond and spring creek settings. They are pre-planted with WETLAND SOD and are anchored using cables and natural rock. This method allows them to be easily added to lined ponds to improve cover and aesthetics. 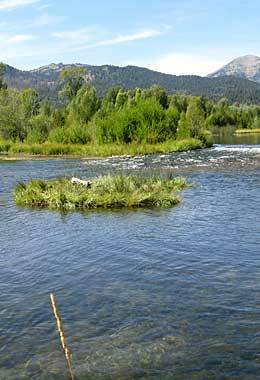 Wildlife islands are simple to install and do not require state or federal permits. They come in a variety of configurations and can be planted with a range of vegetation to meet your specific management needs. Dimensions: Wildlife islands come in a variety of sizes ranging from 90—250 square feet.